The Sunday Times published their Rich List again, 17th December 2017 and whilst it is almost identical to the list I discussed 7 months ago, I did something different this time: I analysed the rich list and the changes list. See below for more! In 2013 I wrote the following page … at the end of this updated version of the page, I have included the Benford’s Law analysis of the 2017 Sunday Times Rich List. Again you will see that the data do not conform to Benford’s expectations. In today’s Sunday Times they published their latest Rich List: the 1,000 richest people in Britain over the last year. I copied and pasted the rich list into an Excel file and analysed it according to Benford’s Law. The red and blue lines on every graph should overlay each other: there should be no diversion between them. 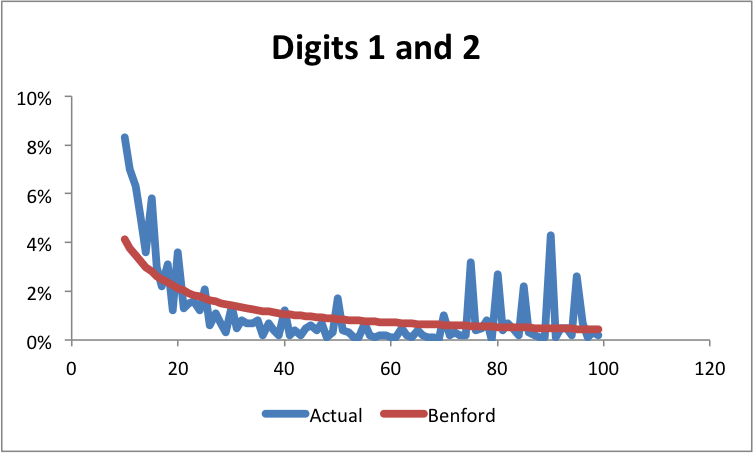 That would mean that the actual distribution of digits within the numbers is equal to the predicted distribution of digits according to Benford’s Law. Whilst the following graphs are not exactly the same as they were in 2013, there do appear to be significant differences between the actual data and Benford’s expectations. For full understanding you need to read more widely about Benford’s Law. However, the main conclusion we can draw from the above graphs is that everything is not as it seems. The sample size in both cases is 1,000 people/companies so that is more than adequate. Any divergence from the Benford predictions or standards suggests that the actual data have been manipulated in some way. Now, I am not saying that The Sunday Times people are crooked or anything but it MIGHT suggest that their methodology might be less than perfect! 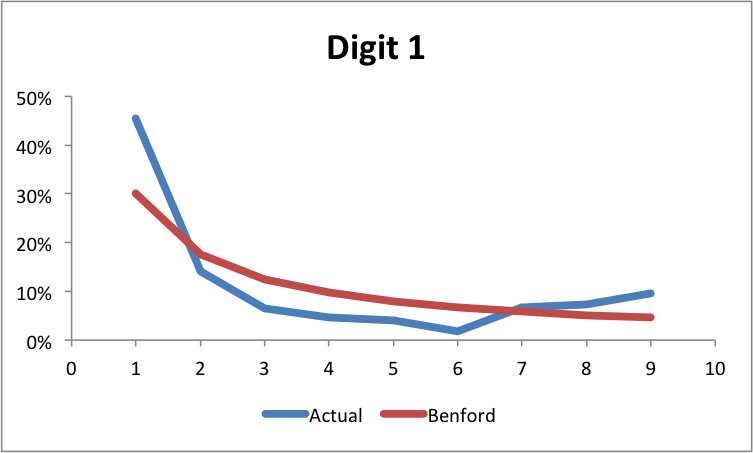 I play with the Rich List with Benford and I usually find that someone is probably bending something: rounding up and down and guesstimates I suppose. However, for the first time I just analysed the list of worth AND the change from list to list (year to year). I found that the main list is not Benford compliant but the column of changes is. This seems to be consistent with the kind of things that Benford experts predict. I have been learning the R stats package over the last year or so and did this latest analysis in that: apart from initially using a method devised by someone else that turned out to be useless, I analysed 1, 2, 3 and 4 digits and none of the results for the main list of values was compliant. Every result of the changes was! There you are: main list suspect but subsidiary list almost perfect! I cannot let you have my spreadsheets because they contains data that are not mine to share. 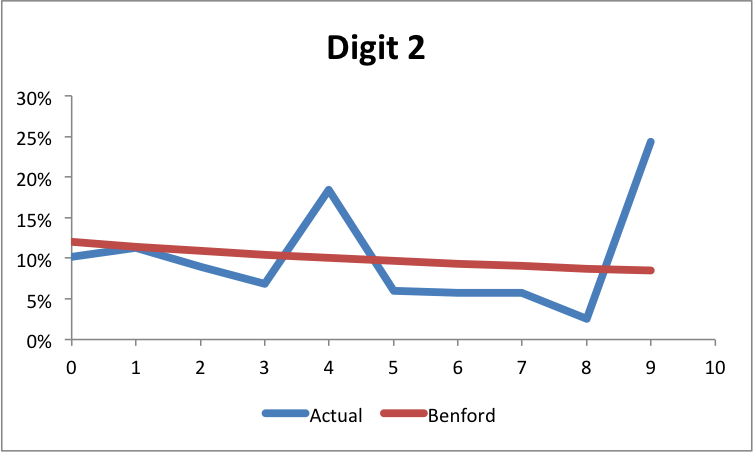 if you want help with Benford’s Law, however, feel free to discuss it with me and I will help if I can. Hi Duncan, would have happened to make an Excel spreadsheet of the 2018 Rich List? Would really appreciate it if you had? Or if you could advise me on how to? Sorry for the delay … I have been travelling and working a lot recently. Yes, I have prepared that file. Do you want a copy or are you hoping for my Benfrd’s Law analysis version?